Blogs, wikis, social bookmarks, social networks, tag clouds – new words for new things, and new ways to use these words. We are living in the world of social media, but for many it’s been a messy jungle with no clear structure. The many facets of social media are also called Web 2.0, consumer generated media, and new media. Most simply social media are made (visual to audio to audio visual) that are designed to be shared. The area of social media is about collaboration, users generating content, sharing and most of all it’s about connecting. 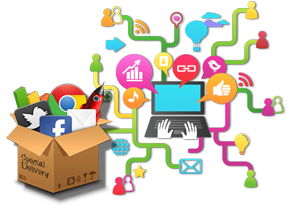 We use Social Media Marketing for our clients to share or create content, knowledge, for attracting web links which altogether helps in getting higher rank in search engines. As we know that Social Media can tie up easily with online marketing strategy and helps in connecting to appropriate or target audience and thereby creating Brand Image of your business. Social Media Marketing has the potential to go high – if users like the content then they will share it with others and thus you get indirect traffic.